I signed up for Annie's Quilted Mysteries Book Club for some enjoyable reading on my Kindle. 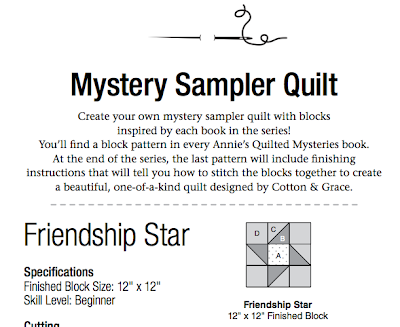 After finishing the first book, A Patchwork Mystery, I was surprised to see at the end, a block pattern for a mystery sampler quilt. There will be a book-inspired block pattern in each of the twelve books in this series. 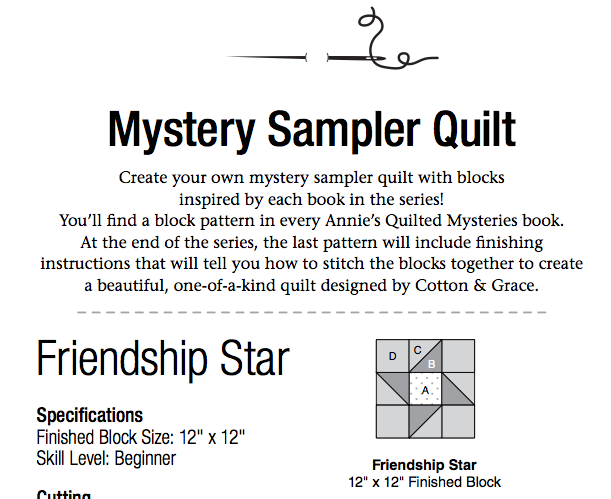 The last book will also include finishing instructions to create a mystery quilt designed by the series characters, Cotton & Grace. The first block is a Friendship Star pattern with a Finished Block Size of 12"x12". I played with a friendship star block pattern in Electric Quilt until I had some fabric from my stash that I thought would work well with it. If you want to make one, here is my rotary cutting printout from EQ for a friendship star. With the ebooks, I have found the block pattern is also available as a PDF to download from their website. I already have the next book on my Kindle ready to read. Looking forward to finishing it and doing the next block. That's a very pretty block. The colours in your block are gorgeous. It feels great to go through the stash and be able to use some of the bits and pieces that we collect. This is a really pretty block; love the bright colors! Wonderful colors for you block, lots of movement!